An analogy may help to make this concept easier to grasp. Let’s say you have a ticket to the opera. You were issued a real paper ticket, but it is just a piece of paper unless it is printed with information that tells you what you are allowed to do with it. You can attend the opera, but you can’t use this ticket to get into the rock concert. What’s more, you can only get into the opera hall on a certain date, at a certain time, and will have to sit in a certain seat. Although you must have the ticket, you won’t know what you can and cannot do if there is no information printed on it. The ticket is meaningless without the information, but the information that gives the ticket it’s value cannot be easily transmitted without some form of physical scaffolding. So, the real paper ticket and the virtual information printed on the ticket are interdependent. In a similar way, your body chemistry creates the very conditions of your health, but that chemistry is directed by bioenergetic processes, which are the virtual (quantum) processes. The real and the virtual work together. From a bioenergetics perspective, all illness starts in the body-field because all physiological processes that break down do so because of information distortions. Consider an allergic reaction. If you have hay fever, then inhaling certain pollen molecules sets off a chemical chain reaction in your body. You experience the effects of that reaction as a runny nose and watery, itchy eyes. There is nothing inherently wrong with your body chemistry. It is working perfectly, responding to protect your body from the allergen, which it considers to be a foreign substance. What has gone wrong is the information your body is processing. Your body somehow mistook harmless pollen molecules for harmful invaders, and your immune system mounted a defense. This is a case of mistaken identity. A misidentification made by your body, at the level of information, results in a real, physical reaction. You can have an allergy shot or take antihistamines to alleviate your symptoms, but they likely will not address the root cause of your problem. 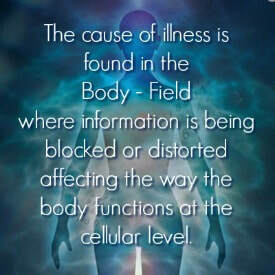 The cause is found in your body-field where information is being blocked or distorted, and as a result affects the way your body functions at a cellular level. Everything that happens at a biochemical level in your body---amino acids arranging themselves only into allowable sequences, DNA unzipping itself to be copied, neurotransmitters cascading through your nervous system, electrochemical impulses firing muscle or heart cells---is mediated by information. Your body has to know what to do, when to do it, how much to do and where the activity should take place, and it has to carry out millions of actions with breathtaking accuracy in milliseconds. Your body and body-field are interdependent, like two side of the same coin. Both aspects of your body---its biochemistry and its bioenergetics---mutually contribute to its optimal functional health, or homeostasis. Illness often is referred to as a loss of homeostasis because your body loses its ability to work properly, compromising your natural, vibrant state of health and well-being. The loss of homeostasis usually is a gradual process, not a catastrophic one, as your body-field’s many information networks slowly deteriorate and that exquisitely organized web of interactions becomes increasingly chaotic. The symptoms of such a loss of physical equilibrium can be subtle or serious.